Grace is situated in the heart of a dynamic university and medical community. 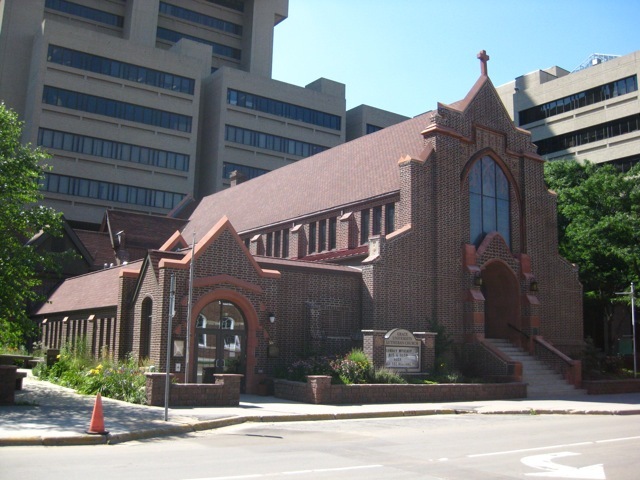 Grace is a congregation of the Evangelical Lutheran Church in America (ELCA), located within the Minneapolis Area Synod (MAS) of the ELCA. We have been a Reconciling in Christ (ReconcilingWorks) congregation since 1985, welcoming all who wish to participate regardless of sexual orientation, economic status, or ethnic identity. 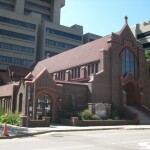 We have a strong and unique partnership with Lutheran Campus Ministry-Twin Cities, which is housed within our building. Our church building is fully accessible with a ramp, elevator, and handicap-accessible restrooms. Our church building is located in the geographical center of the Twin Cities metro area, on the East Bank of the University of Minnesota, next to the Fairview-University Medical Center. We openly welcome students and hospital visitors, those who pass by our doors each day and those who are drawn to this vibrant neighborhood for a variety of reasons. Learn about our Peace Garden and our sanctuary Mural and Logo. Grace has a unique founding and history, which you can read about more on our History page.